In other words, it’s an “I’m not naive and I wasn’t born yesterday statement” or as Evan translates it “I am not a an ignorant country bumpkin who just arrived in the big city on a truck full of lowly turnips that I was dumb enough, on top of everything else, to fall off of.” My next reaction is to wonder why it is so often that I’ve heard turnips proceeded by the adjective ‘lowly’. I mean, I’ve never heard anyone describe a beet or a carrot or kohlrabi as lowly but in contemplating this, I decide that if lowly means humble, I might enjoy turnips even more. Nutritionally, it couldn’t be further from the truth. Turnips, when eaten with their greens, pack an enormous punch. They’re rich in vitamins A, C and in Calcium. In fact, turnip greens are more nutrient dense in calcium than milk. Suddenly, I have endless possibilities for this post. By enrolling in our CSA and advocating the same position for others, I’m already buying into the rural side of the urban-rural rivalry. Sure I live in the city but I prefer slow food, harvested locally and without pesticides reminiscent of my rural ancestry in Kansas. And knowing that turnips make a generous contribution to the health and wellness of my family cause me to want to climb right into the back of the flatbed. 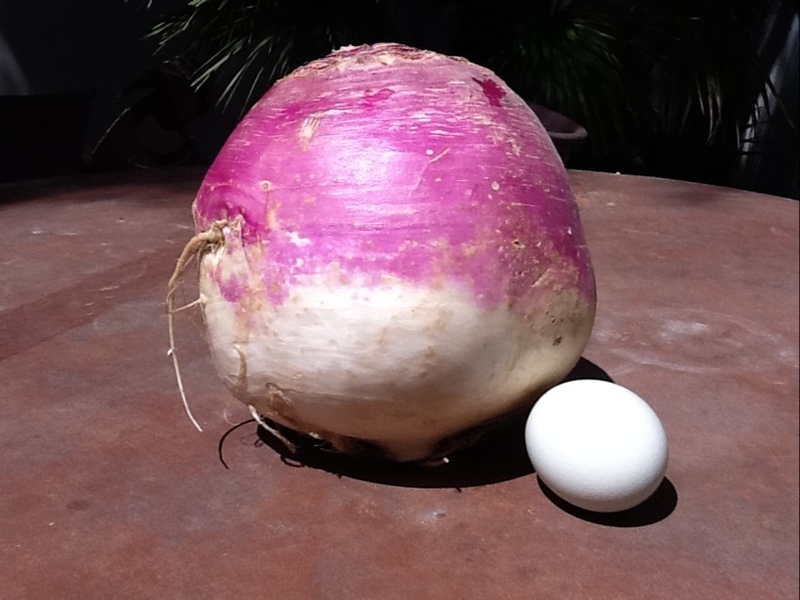 Heck, given that it’s National Poetry Month, I find myself scratching out an ode to the Turnip to post on Jessie Carty’s Thursday poemshare. The reality is that each year, turnips are probably the most challenging element of my CSA. I enjoy the small white dense Hakurei variety but the purple and white ones with their distinct flavor are more difficult. Over the years I’ve disguised them in many dishes and Mr. Neep has been most helpful with ideas including the turnips in white sauce that I can serve for company. Still, when a 3 lb turnip arrived in my CSA bag this week, I was a bit perplexed. Preheat oven to 350. Hollow out the turnips with a melon ball tool. I then blanched all the turnip pieces in boiling salted water for about 2 minutes before plunging them into iced water. In a large skillet, heat olive oil. Add garlic and jalapeño and saute for a couple of minutes. Add sausage and swiss chard and continue cooking until chard is wilted. Remove from heat and transfer to a bowl. Stir in bread crumbs, turnip scooped from the insides, seasoning and cheese. Pack this mixture into the dry turnip halves tightly. You may want to top with a little extra cheese. I baked these for about 40 minutes. The shell was still a bit tough but the contents were flavorful and well cooked. I’d love to try a Mexican variety with roasted green chilis and cumin. So, come on. Jump on the turnip truck. I remember when I was little that my grandfather had his photo in the paper with giant turnips. They were much bigger than this one. It’s called slide show and is a feature. I’ll bet you can too. Yes, it is a challenge to make turnips look good. I have just discovered that I love turnips! I can’t remember ever having them as a kid, but I keep eating them raw with carrots. Shall have to try your recipe! Report back Hannah. My kids really did eat them right up. I don’t know if they are common in India Tes. Canadian families living in Germany post-war tell of Germans being appalled that Cdns actually ate turnips. The German people fed them to their pigs. Perhaps that is part of the “lowly”. I still don’t know if Germans eat turnip today or not. Ahh, I was going to tell of Charlotte knitting the word Humble for Wilbur. You might be right about the pigs. That would make a very nice soup. You are right. Take the stuffing and add broth. I didn’t know they were packed with so much that was good for us. 🙂 Thank you, Tammy, for teaching us about the turnip and then providing a great recipe too. You are so nice! On my way over there! That is BEAUTIFUL!! I also love how you got the images to flash like that. it’s a wordpress feature called slide show. Not hard at all. Ah, I have awaited this turnip post with eager anticipation, Tammy, and that recipe is such a great payoff. Thank you!! Let me know if you try it Kate. That is the biggest turnip I have ever seen. Your stuffed idea is marvelous! I usually just clean, chop, toss with olive oil and salt and pepper and roast. They are yummy roasted. I still have to disguise them in some way – lots of spice and mixed with other roots. If the greens are too bitter for you, try blanching them for a minute first. Sounds good. I never ate turnips before the CSA, but I like them now. We received turnips regularly from our CSA. Most often, I cooked and mashed them with potatoes. The smaller ones, I sauteed up with the greens in olive oil, garlic, and crushed red pepper. That stuffed turnip looks amazing. Thanks, Tammy. I like them sauteed the way you are suggesting with the greens. I seem to have missed what a CSA is….? I eat them mashed but I have to mix them with potatoes. I’ve never enjoyed turnips cooked, but if you pull them up when they’re still on the small side, they’re delicious raw. Just peel ’em and eat! I also like the small white ones raw. Also, I had no idea they are so rich in calcium! This is very interesting for me because I cannot eat most dairy products. Very interesting information Kath. That would add to the lowly turnip status. Hope you’ll jump on board. And check out the nutrition link. Your stuffed turnip recipe looks fantastic! I kind of want to go buy a 3 lb turnip now just to recreate this in my kitchen…I have turnips, but they are all going into another batch of the soup I just posted about. Thanks for the recipes and info!! Thanks for visiting Erin. I’ll head over to read the soup recipe. I also host a food site, and am a chef by trade, or simply a cook who is passionate about all things food! Good insight Elizabeth! Thanks for visiting. That looks like an extremely tasty dish! I love all vegetables and just had an amazingly yummy, huge, colorful, fresh vegetables salad a couple of days ago (I usually eat different things each day and two huge salads per week). This is when I stock up on all my vitamins so to say, and turnips are very much a part of the menu. There are different varieties and I really like the red salad turnips raw. Oh yes, the red salad ones are the best! My mother always used to say, “Lettuce, turnips and peas.” We would laugh and laugh….now, I am enjoying this remarkable food FRESH in many ways and dishes ~ Thanks Tammy for reminding us of the turnips! Sometimes they are forgotten. seems more often than not. What a delicious post Tammy. Agreed. It’s such an underrated experience! I love turnips the way my mother would make them when I was a little girl in Canada. She would boil then and mash them with butter, salt and pepper and brown sugar. Oh boy, were they delicious. In fact today for Easter we are going to mums and she has promised me there will be a bowl of freshly mashed turnips in my honor. Your receipe sounds delish Tammy, I’m going to try it. I don’t know about brown sugar in the turnips but I do like the savory variety. I love turnips and their sour taste! Even the greens are good in soups with lamb shanks! Other than that, I love the idea of stuffing them like you did. In Lebanon, turnips are made into pickles and eaten with every sandwich, every day (they are dyed pink too with beets); there is also a stuffed turnip recipe. I had no idea that they were so popular there. Tammy, I have not eaten turnips in a couple of months. It is fun to include them with rutabagas and potatoes and sweet potatoes and onions and roast them with a little olive oil in an oven until done. Tonight we’re having rutabaga “french fries”. When we get back from our vacation, I’m picking up turnips again, thanks to your reminder. hmmm rutabaga french fries sound interesting. Wow, that sounds like a very interesting remedy. I think it might be too hot to store honey in a turnip here. Nice work with the Colossus! I have made turnip gratins, in similar fashion to potato gratins, with the jumbo ones that have been pretty tasty. down to salad turnips now which are easier for me. Turnips can be a bit of a challenge. I like to make a warm lentil salad with them – cook cubed turnips in lots of butter or duck fat until they’re soft, then toss them with cooked green lentils and a punchy vinaigrette. Stir in the turnip greens until they wilt. Delicious. I love lentils in any fashion – haven’t thought of putting them with turnips. Mmmm, I could use my homemade sausage in this! I usually get rid of my turnips in stews but this looks like a lot of fun–and takes care of some swiss chard in the process, always a bonus! Give ’em a try. They were great the first day but didn’t warm too well after that. Great post, Tammy, and super cool slide show! I rather like turnips and used to grow them a long time ago, but Dave doesn’t like them, so it’s been ages since I’ve cooked any. That big one is impressive! I think if you leave them in the ground, they’ll just keep growing! Sneak them into something without Dave knowing. I never would have thought of stuffed turnips, I am very intrigued. I have seen turnips but not this big. From what I’ve been told, they will just keep growing if you leave them in the ground. I grew so many turnips this year, but they were awfully bitter. Dang AZ soil. Not made for turnips. Maybe I should have tried this recipe? Blanche them first to reduce the bitter. That’s what I have to do. Great idea! I have about 3 turnips left from my CSA box this week. Any vegetarian friendly suggestions? I like them mashed with potatoes. Deborah Madison also has a good soup recipe where you float the greens on the top. I’m glad to know I’m not the only one who gets somewhat perplexed by the turnips in her CSA box! This recipe sounds delicious. I will have to try it when the large turnips come around again. Thanks for the great post! Let me know what you think and pass along only other recipes that work for you!